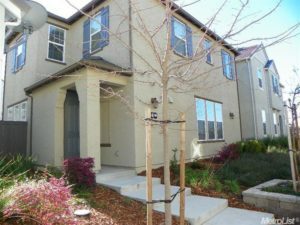 Gorgeous townhome in the Villemont Community in Roseville, located in a fantastic gated community minutes from everything, this home has a LOT to offer! From an upscale clubhouse with fitness center and sparkling pool and spa, surrounded by biking and walking trails, a quick walk to dinning,Starbucks and shopping to a very fast car ride to Hwy 65 and the Galleria Mall! This two story, 3 bedroom, 16324 square foot townhouse has a nice floor plan, very open downstairs living area, comfortable dinning and living room, spacious kitchen with granite counter tops and stainless steel appliances, 3 spacious bedrooms located upstairs and a total of 2.5bathrooms. Within the gated community, there is a beautiful clubhouse that has a huge outdoor pool and spa, fitness center with cardio equipment ,free weights and exercise bikes. Also available is a section of the clubhouse with kitchen and lounge areas for parties and get-togethers. There is also a playground area to take the kids. This home is located at 182 Talmont Cir Roseville, California. The nearest schools are Brown Elementary School, Buljan Middle School and Roseville High School.